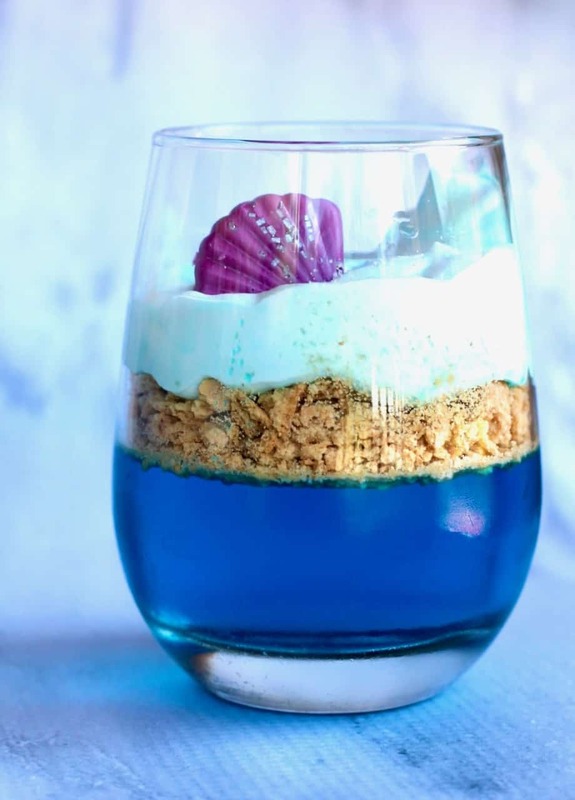 Having a beach themed party this year, make these easy layered jell-o beach parfaits. The kids and parents will both love these desserts and the best part is that you can make this dessert ahead of time. 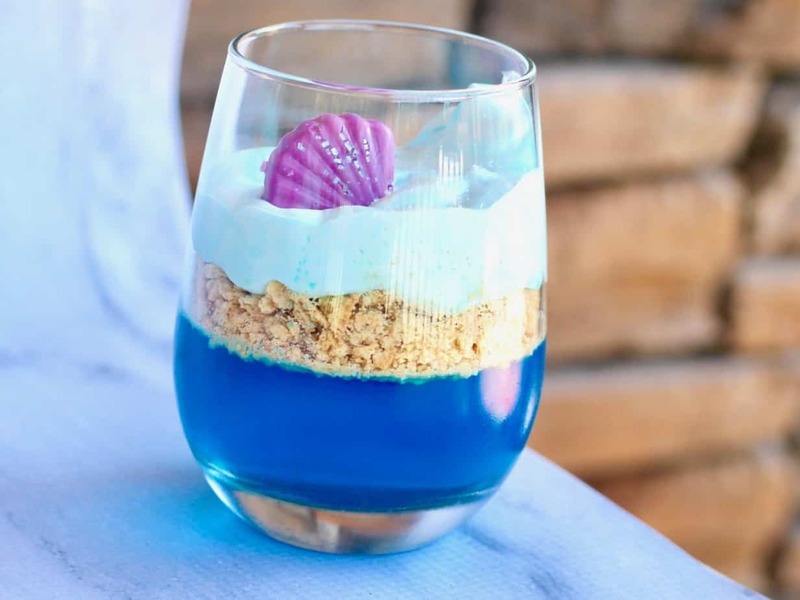 These beach layered desserts will be great for a beach, mermaid, shark, luau and many more different themes. 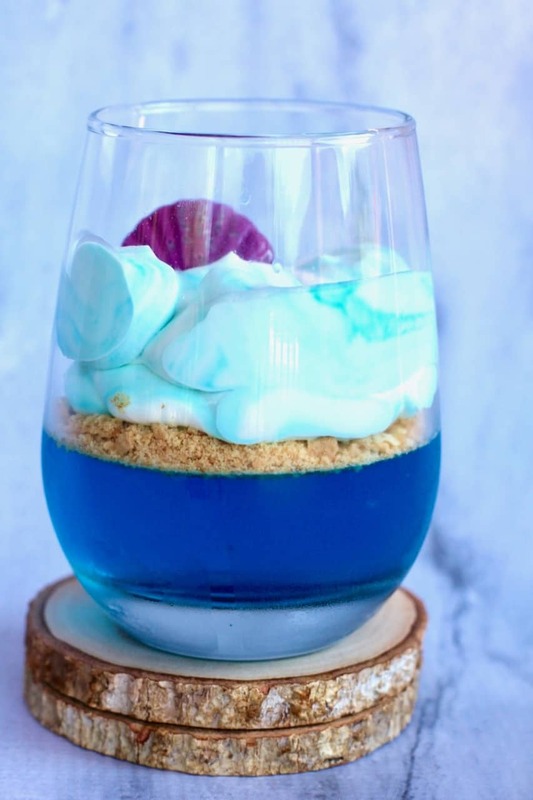 I love tinting the whip cream to a light blue because it looks like the waves are crashing against the beach. Make blue jell-o according to package directions. Divide amongst 4 glasses and chill in refrigerator for at least 3 hours. Pipe in the whipped creamTop with a chocolate seashell, umbrella or sprinkles if desired. 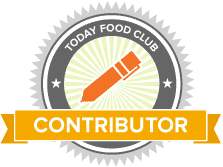 So easy to make and can be made a day ahead of time. These can be made in clear plastic cups if serving at a children’s party or in stemless wine glasses for an adult get together. They look so pretty on a dessert table. 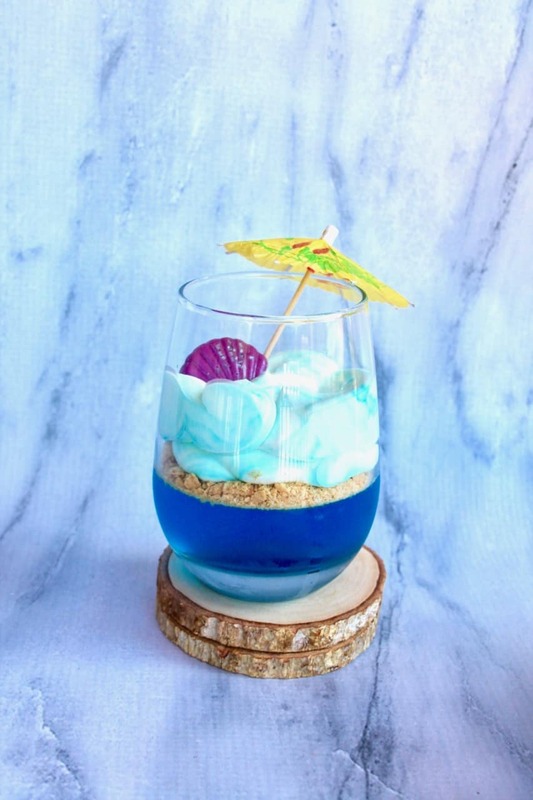 Who doesn’t love a good beach themed party? 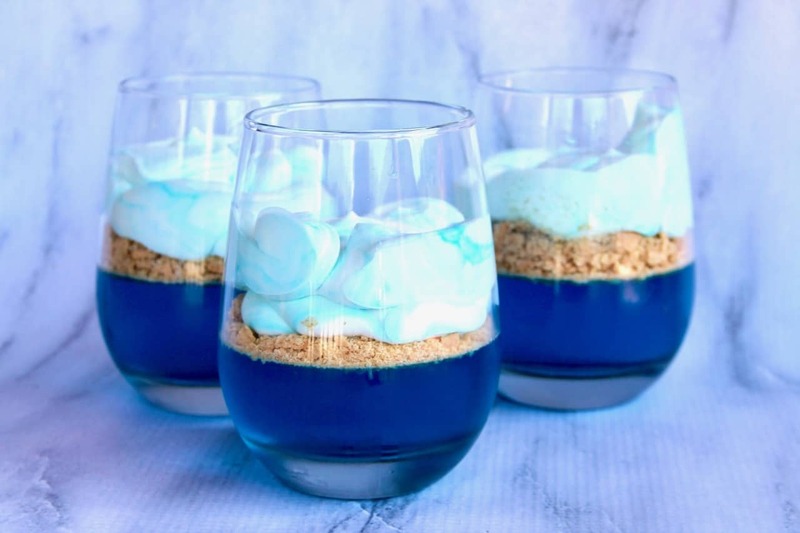 I love how the blue jell-o looks almost like a Caribbean sea. If you are hosting a mermaid theme party these would be adorable along with my mermaid tails. Every little girls dream. Having a Shark Week party…. these would work for that as well, simply add a plastic shark fin or make one out of chocolate to put in the wave- super cute, creative and fun. 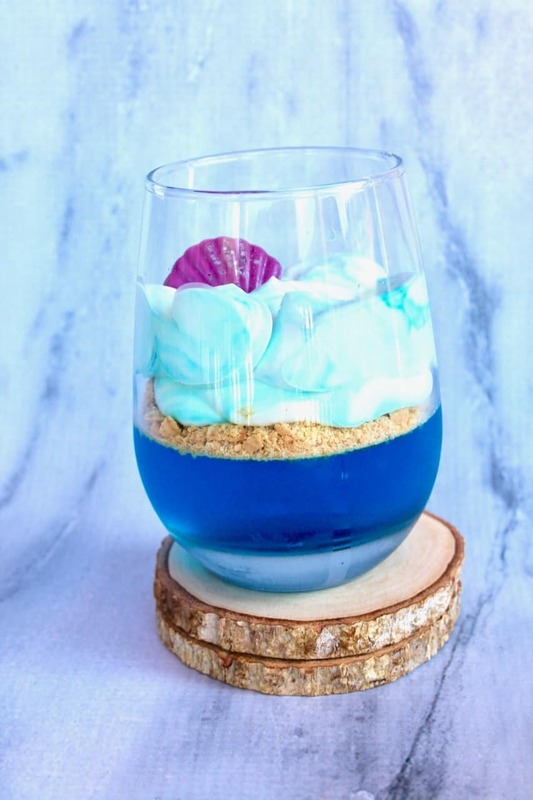 Whatever kind of get together you are having be sure to include these beach layered jell-o desserts, they really make a statement and are delicious as well. If you are looking for some other jell-o ideas…… sea glass jell-o, spring themed jell-o and valentine’s day jell-o.